You can configure a CDN and SSL on for your domain to improve security, uptime, and performance. 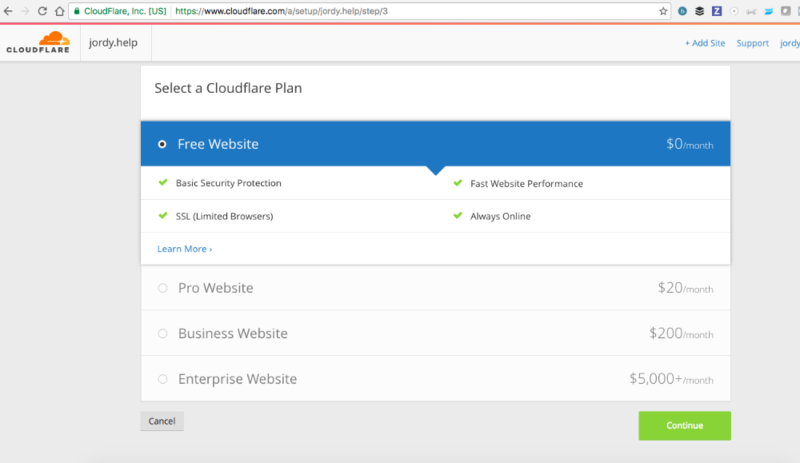 There are many options for this, but we recommend using Cloudflare because it's easy to set up, works great, and it's free! Please note, that if you user one of our free domains that we provide on thegrid.ai that this is already set up for you! However, if you've set up a custom domain, we suggest that you set this up for your site. CDN stands for Contend Delivery Network. In short, what it does is move your content closer to your visitors so that it lowers the load time of your sites. SSL stands for Secure Socket Layer and is the standard security technology for establishing an encrypted link between a web server and a browser. SSL makes your site more secure, but it also improves performance. All of this sounds like something you want, right? Let's get it set up! 1. You'll want to make sure that you have your custom domain DNS settings configured. Check this article and video for instructions. 2. You'll need to create a free Cloudflare account. Head to https://www.cloudflare.com/ and sign up. 3. The wizard at Cloudflare will guide your through setup, but the first thing you'll do is add your site to your Cloudflare account. Enter your domain in the box below and click "Scan DNS Records" and then your site will be scanned. 4. 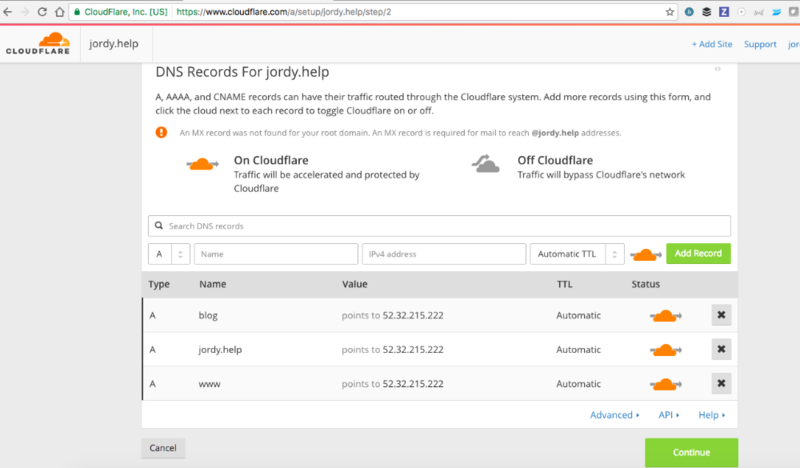 Once Cloudflare has scanned your site, your DNS settings for your domain and all of your subdomains will be populated. You'll want to confirm that they are all correct and then click "Continue". 5. Once confirmed, you'll be taken to plan selection. You can select whichever plan suits your needs. However, more most users the free plan will work fine. Select your plan and click "Continue". 6. After you select your plan, you current nameservers and the nameservers that you'll need to change to are displayed. 7. 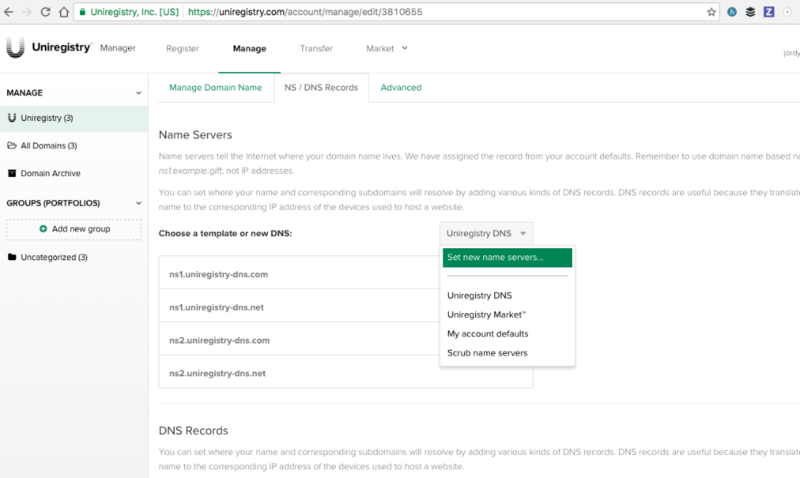 Open the DNS/Nameserver settings of your domain at your providers control panel. We recommend our partner Uniregistry for which we will be able to provide you with the best support. From your Name Servers setting, select "Set new name servers..."
8. 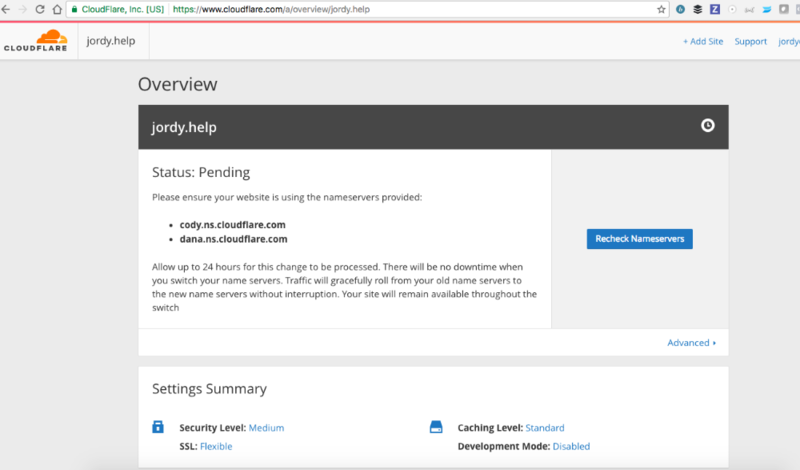 Copy the Nameservers shown in your Cloudflare account, and add them to your domain. Then, click "Save Changes". 9. 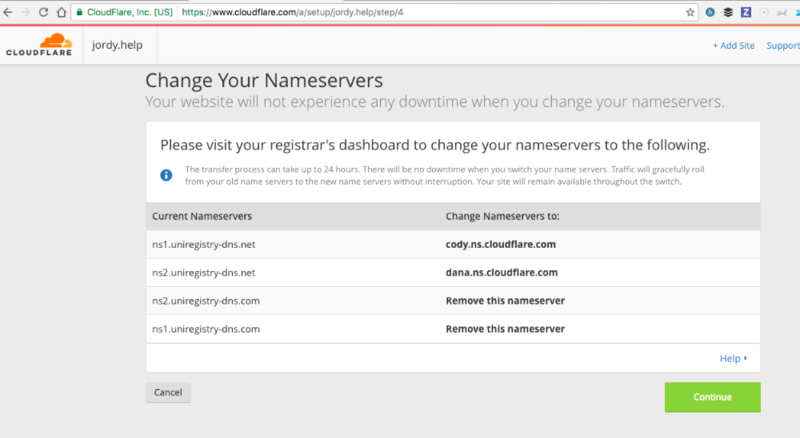 Head back to your Cloudflare account Change Your Nameservers screen and click "Continue". This will bring up your Overview screen. The status will show as Pending as it can take up to 24 hours for the change to take affect. 10. When your nameservers take affect, you'll be sent a notification by email. You can then log in to Cloudflare and see your site details. Congrats! You now have a faster, more secure, and more reliable site.